Considering whether to age in place or make a move is often a life changing decision. 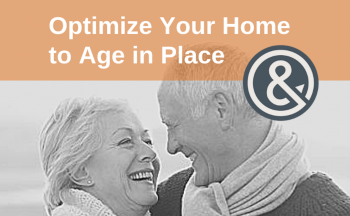 At some point in life, many people review whether they should optimize their current home to age in place, or make a move to a home that works better for them. Most people prefer living in their own home throughout their lifetime, whether it is one they have lived in a long time, or one they choose in their retirement years. The desire for familiarity and independence, as well as a location near existing friends and family, often drives the desire of where to live. At some point in their lifetime, many people will have a mobility or health challenge, so planning ahead will maximize the ability to age in place or handle a temporary health challenge. Although no home is perfectly equipped for all situations, a home can be optimized to benefit its occupants. The first consideration is to decide if the current home can be modified to work. Typically that includes evaluating whether the home and yard are the proper size, and in a desirable location. If not, it is best to make the move and consider a newer home or even a newly built home if the existing home won’t work well. Although moving is a hard, it often provides significant relief and results in less worry on a day to day basis. In addition to home features that help people age in place, sometimes simply hiring help for cleaning, cooking, laundry, yard work, HVAC maintenance, and general home maintenance can make life easier. Some owners are opting for a multi-generational lifestyle, which includes two or more generations of people who put their resources together and combine households. Currently, 20% of households are multi-generational. To learn more about the popularity of a multi-generational lifestyle, visit this article at https://www.pathpost.com/boom-in-multi-generational-living/. To see homes that might work for joining households, visit https://www.pathpost.com/multigenerational-living/. If more help is needed, then an independent living apartment or an assisted living home might be worth considering. Independent living is just that. Residents still maintain their former lifestyle, just minus some of the burdens of home ownership. Assisted living typically includes help with medications, planned activities, and no burdens of home ownership. Some assisted living homes have a memory care component to help those residents stay safe. Unfortunately, some criminals target homeowners who they think are older and more susceptible to identity theft or unnecessary purchases or bogus charitable contributions. Criminals either go door to door offering bogus services, or call on the phone, or send solicitations in the mail, often looking like official government documents or bills that need to be paid. Having a video doorbell or security cameras with motion sensors can be helpful. Some seniors will give a relative or neighbor access to motion alerts to help screen and turn away solicitors. Putting up No Trespassing or No Soliciting signs can be helpful, too. To stop many robo pre-recorded type calls, visit https://www.nomorobo.com. This site helps to block unwanted robo telemarketing calls for free on your VoIP landline. If your phone service is from an internet provider, like Comcast, this will work for you. It doesn’t work on traditional landline phones. Some landline providers have other services to block unwanted calls or limit calls to a pre-determined list of friends, family and businesses like doctors and pharmacies, so check with your provider for the best options. There are some smartphone apps that will stop robo, telemarketing, and spam calls to your iPhone or Android device. Legitimate robo messages like from a doctor, pharmacy or school, will not be blocked by these services. Solicitations will sometimes come in the mail, and look like official government documents or bills that need to be paid. If a senior is prone to being tricked, it can help to collect all bills and review them weekly with a trusted friend or family member, to be sure money isn’t spent on bogus invoices or charities. Why Path & Post Real Estate? Path & Post Real Estate team members believe understanding someone’s life transition associated with considering a move is important. We take seriously our role as your guide in this important stage in your life, and are happy to consult with you on your options. Our goal is simple….to help you achieve your goals, whether it involves making a move or staying put in your current home!